Your Home Is Guaranteed Sold in 30 Days! 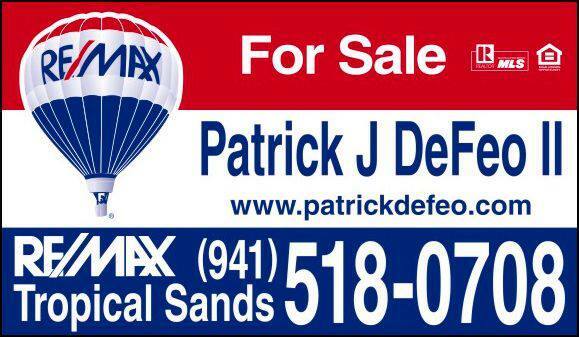 I'm Patrick DeFeo with Re/Max Tropical Sands and I can help you find the right home whether you're selling or buying. We Guarantee Your Home Sold! Your home is Guaranteed Sold in 30 days or I will pay you $100's per day cash until sold! * Click Here For 30 Sold Guarantee Information Patrick DeFeo is your Re/Max Hall of Fame real estate expert! Want your home sold for maximum value in the shortest time? We wrote the book on getting it done! Whether you have a multi-million dollar estate, condo at the beach or acreage, our program gets the results you want. Since 1997, our team has sold over 2800 properties and over $700,000,000 in volume. We are available 7 days a week to give you unparalleled service, marketing and the results you expect. Have you tried to sell your home before with no results? Patrick specializes in selling homes that don't sell the 1st, 2nd or more times on the market. We answer the phone live 7 days a week. Call our toll free line now 855-919-7653(SOLD) for the personal attention you want with the results you need.